(Leo Castelli, New York); sold 1974 to Paine Webber/Mitchell, Hutchins Group, New York; Mr. and Mrs. Donald B. Marron, New York, by 1981; purchased 1983 through (Leo Castelli, New York) by NGA. E-mail message, 20 December 2012, from Natasha Sigmund, Registrar, Estate of Roy Lichtenstein, New York, copy in NGA curatorial files. The painting was lent by the corporation to a 1978 exhibition. Mr. Marron was the corporation's CEO, and its collection grew out of his own personal collecting. The Marrons are listed as lenders to a 1981 exhibition. In Three Dimensions, Leo Castelli Gallery, New York, 1974. Roy Lichtenstein: Posters, Prints, Drawings, Paintings, Sullivan Gallery, Ohio State University, Columbus, 1975. 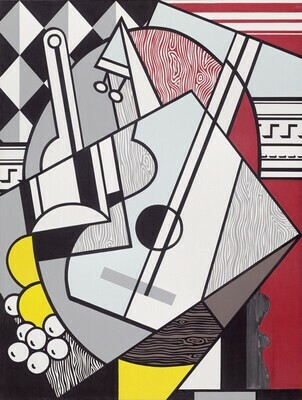 Paintings, Prints, Drawings, Sculptures by Roy Lichtenstein, Seattle Art Museum, 1976. Art at Work: Recent Art from Corporate Collections, Whitney Museum of American Art, New York, 1978, no. 17, repro. Art Inc: American Paintings from Corporate Collections, Montgomery Museum of Fine Arts, Alabama; Corcoran Gallery of Art, Washington, D.C.; Indianapolis Museum of Art; San Diego Museum of Art, 1979, unnumbered catalogue, repro. Roy Lichtenstein 1970-1980, Saint Louis Art Museum; Seattle Art Museum; Whitney Museum of American Art, New York; Fort Worth Art Museum, 1981-1982, unnumbered catalogue, repro. Roy Lichtenstein, travelling exh. organized by Solomon R. Guggenheim Museum, New York (7 venues), 1993-1996, no. 175, repro. (shown only at Guggenheim Museum, New York, Los Angeles Museum of Contemporary Art, and Musée des Beaux Arts, Montreal). Strick, Jeremy. Twentieth Century Painting and Sculpture: Selections for the Tenth Anniversary of the East Building. Washington, D.C., 1989: 128, repro. 129. American Paintings: An Illustrated Catalogue. National Gallery of Art, Washington, 1992: 227, repro. National Gallery of Art, Washington. National Gallery of Art, Washington, 1992: 273, repro.